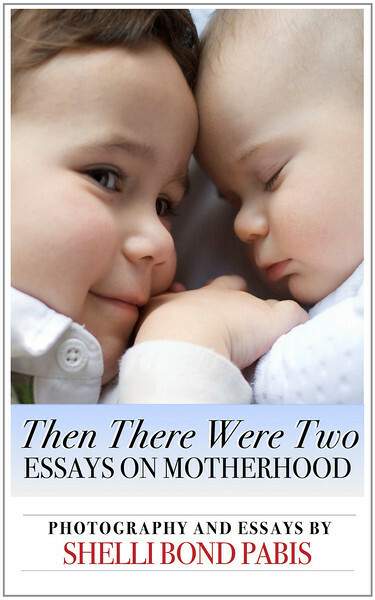 I’m extremely excited to announce that I have published my very first e-book, Then There Were Two: Essays on Motherhood. The essays in Then There Were Two embrace the joys, worries and misadventures a mother can have after welcoming her second baby into the world. From missing the simple routine of caring for just one child to navigating a day at the mall, Shelli Bond Pabis writes in an easy-going manner of one mother speaking to another. Sometimes lyrical and sometimes matter-of-fact, she assures her readers that there’s no consensus on how to raise a child. Her photography adds a beautiful dimension to the book with quiet moments, details of nature and the action of life with children. Mothers will identify with these essays, laugh, cry, and feel satisfied as Pabis surprises herself by finding contentment in the creative job of being a mother. They’ll find themselves wanting to ramble around in their own yards with their children, picking up acorns and listening to the sounds of crickets. This little book of essays and photography is very special to me not only because it’s my first book but because it contains special memories from a time when I had one small boy and a brand new infant. I began writing my newspaper column for the Barrow Journal two months before my second son was born, and many of these essays are adaptions of those early columns. Most of them have not appeared on this blog, though a few of them have. The book is about a mother learning how to adapt to life with two children, but you’ll also find musings on nature, family issues, daily life and more. I don’t offer much advice; I only hope any new mother who reads it will know she’s not alone. After all, no matter what your experience, you are doing the most important job in the world ~ carrying on this gift of life. I hope you’ll buy the book, and I really hope that you will like the book. If you do, I would greatly appreciate your help by offering your good reviews and spreading the word about my book on your social media outlets. Thank you so, so much. View it on Amazon U.S.
Stay tuned to receive news about my future e-books on how to start a storytelling ritual in your family, homeschooling preschool thru kindergarten and more! So glad you like the cover! Thanks. Congratulations, Shelli, on completing the book. I’m sure it’s going to be a lot of fun–and learning–to read through it. I’m so proud of you! I’ll be purchasing soon!